Idaho Man Found Guilty of Conspiracy and Attempt to Provide Material Support and Possession of an Unregistered Destructive Device, US Department of Justice reports. A federal jury in the District of Idaho returned guilty verdicts today against Fazliddin Kurbanov, 33, on charges that he conspired and attempted to provide material support to a designated foreign terrorist organization and possessed an unregistered destructive device. The jury found the defendant not guilty on two other charges. Assistant Attorney General for National Security John P. Carlin, U.S. Attorney Wendy J. Olson of the District of Idaho and Special Agent in Charge Eric Barnhart of the FBI’s Salt Lake City Division made the announcement. Kurbanov’s conviction followed a 20-day trial before Senior U.S. District Court Judge Edward J. Lodge of the District of Idaho. The jury deliberated two before reaching its verdict. Between the summer of 2012 and his arrest in May 2013, Kurbanov, an Uzbek national living in Boise, communicated by email and Skype with a person or persons operating a website for the Islamic Movement of Uzbekistan (IMU), a designated foreign terrorist organization. Kurbanov discussed with the website administrator his animosity toward Americans, particularly the military; his desire to build a bomb; possible targets in the United States, including military bases in Idaho and Texas – and his need for instruction on how to construct and remotely detonate a bomb. Additionally, Kurbanov searched for and later discussed with an FBI confidential human source targets including military bases in the United States, specifically West Point Military Academy in New York. The website administrator asked the defendant to obtain a specific anti-virus software to protect the IMU’s website and to obtain and provide any amount of money. The defendant contacted his brother, who lived in Kyrgyzstan, about obtaining the anti-virus software and he sent the software to Kurbanov. Shortly before his arrest, the defendant caused an Idaho corporation to open, through which he intended to funnel money to the IMU. Between at least Nov. 15, 2012, and May 16, 2013, Kurbanov possessed bomb-making components at his Boise apartment, including a hollow hand grenade, a hobby fuse, ammunition containing smokeless powder, tannerite, aluminum powder, potassium nitrate, charcoal, yellow sulfur powder and fertilizer. He purchased these items during the summer and fall of 2012. FBI special agents observed the bomb-making components during a court-authorized search of Kurbanov’s apartment in November 2012 and seized many of the same items during a second court-authorized search in May 2013. 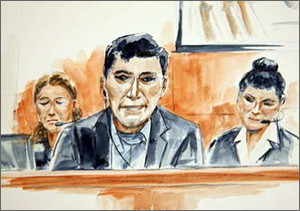 Kurbanov’s activities were closely monitored by federal agents during the investigation and no terrorist attack occurred. Sentencing is set for Nov. 10, 2015. Kurbanov faces a maximum of 15 years in prison on each of the conspiracy and attempt counts, and 10 years in prison for possession of an unregistered destructive device. In addition, Kurbanov faces a separate one-count indictment in federal court in Utah alleging that from about Jan. 14, 2013, continuing through Jan. 24, 2013, he taught and demonstrated how to make explosive devices, and distributed information relating to the manufacture and use of an explosive or weapon of mass destruction. His alleged intent was that the teaching, demonstration and information be used for, and in furtherance of, an activity that would constitute a federal crime of violence. The Utah indictment was returned in May 2013, at the same time as the Idaho indictment. The case was investigated by the FBI’s Joint Terrorism Task Force with assistance from the Boise Police Department, the Department of Homeland Security, Immigration and Customs Enforcement’s Homeland Security Investigations, the Ada County, Idaho, Sheriff’s Office and the Canyon County, Idaho, Sheriff’s Office. The case is being prosecuted by Assistant U.S. Attorneys Aaron Lucoff and Heather Patricco of the District of Idaho and Trial Attorney Larry Schneider of the National Security Division’s Counterterrorism Section.